The St. Raphael oil is just a vehicle that God uses to heal us. We are all instruments of God, only JESUS CHRIST is the Divine Physician and healer. TBT~ Greetings from the Philippines! I am Elsa R. A.. I am a plain housewife and a non-practicing registered nurse. I am married to a lawyer and blessed with 5 kids. I am a Marian Devotee and I make rosaries and give them away for free. I have been experiencing some health issues these past few months and been constantly praying for miracles of healing. Last September 11, a few days after Blessed Mother’s birthday and my birthday (September 8), I found a prayer card of St. Raphael and I remembered that I had the holy oil of St. Raphael from your ministry. Luckily, I found it I browsed through the label of the holy oil- “Contents: olive oil and rose petals”. I looked inside the bottle and to my surprise, the rose petals are no longer there. What I saw mixed with the olive oil are glitters colored silver and gold or are also known as escarchas. Tears fell from my eyes because Mama Mary once again made her presence felt through the holy oil of St. Raphael. I believe that this is an answered prayer for my healing and other intentions. May you continue to give hope and healing around the world through this holy oil. Truly, St. Raphael is the medicine of God. More power and more blessing to all! 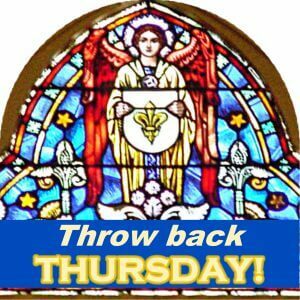 TBT~ I was given St. Raphael oil. My nephew had a cancerous tumor on his brain. I could not get to him before his surgery so I put the oil on my head and prayed for him by proxy. The surgery was to last several hours. An MRI was taken before the surgery. His brain was tumor free! The doctors were so surprised! They looked and looked but could find nothing! My nephew’s wife passed out when the doctors told her that there was nothing wrong with her husband. God bless you Fr. Joe and the St. Raphael Ministry!!!!! Good morning and all praise and glory to God and thanksgiving to St. Raphael, God’s healing Archangel! St. Raphael never fails to help his little ones. I have been using the St. Raphael oil to heal a skin ailment and with persistent prayer and use of the healing oil all is clear! Truly miraculous! Thank you, Father and St. Raphael! Complements of the season. Hope all are keeping fine with God’s grace. We are experiencing God’s healing love with the powerful intercession of St. Raphael and blessed Mother Mary thanks be to your blessed oil. One of my colleague’s nephew, who is just two and half years old, having a hole in the heart was admitted recently as both of his lungs were affected. The poor little chap had a continuous Cough that he couldn’t sleep at all. I found out a couple of days later and as soon as I heard it I gave them the oil bottle along with the prayer card (Normally I keep an additional oil bottle and a prayer card in my bag for such an emergency). Praise the Lord, that night when they applied the oil on his chest after saying the prayer, the terrible cough had stopped and truly the Doctors couldn’t believe it. The parents thanked me immensely for the miraculous oil and the baby was discharged the following day. The sweetest thing is that after this incident whenever he gets a cough, the baby keeps asking “please apply Jesus’s oil”. See how the little ones experience God’s healing love. Another Colleague of mine stated that last week before she left the office, she had a feeling of saying the St.Raphael prayer and to apply some oil. So she did and on her way to home, a Three Wheeler hit her but she escaped without any injury. Praise the Lord almighty! A poor Cancer patient whose surgery is being postponed for six months due to the negligence of Doctors and her own difficulties is still alive mainly due to her trust in this miraculous oil. She is a non Catholic but has a great devotion to Our Lady. Another friend of mine claims that her only relief for the terrible knee pain is this miraculous St.Raphael oil. Last not least , my brother had a non healing skin disease and praise the Lord it is almost healed with oil applied. So my beloved friends at St.Raphael Oil Ministry, the work you do is really really appreciated and truly it will be rewarded by our Loving Heavenly Father. Many at Sri Lanka needs the St.Raphael oil as they experience it’s miraculous power. Greetings from Papua New Guinea. I was given the St Raphael Healing Oil by my friend Evelyn just last week. She told me about how it helped her big sister. I had a lump on my lower left abdomen along with years of pain there and my lower back. I was due to go back to hospital on 26th and 28th of November for surgery to remove the lump. By the grace of God and the help of St Raphael and praying the Holy Rosary I have been healed! The pain has left and the lump is slowly disappearing. I cannot express any more how amazed I am! All this happened in days. Thank you to God Most High for making it possible and for the St Raphael Healing Ministry for all the good works you are doing. A month a ago I had a hysterectomy and ended up with the complication of infection. A drainage tube was inserted. After 2 weeks the infection had cleared but the tube was not removed because there was still an opening the doctors wanted to heal. Naturally I was upset. I have prayed to archangels before in times of need. This time when I went to research healing prayers, your website came back in the top results. I contacted you and the oil arrived in 3 days! I started using the oil daily while waiting for my next two week check up praying that my pelvic area would heal enough for the removal. My prayers were answered. It was removed today! I could feel Archangel Raphael and Mother Mary by my side for the past two weeks and a feeling of peace falling over me each time I prayed. I believe the use of the oil and prayers shorten the time the drainage tube had to be left in. I used the St. Raphael oil over a woman in a coma unconscious for 2 days, and 3 minutes after the blessed oil was laid she came back to life. There are other countless testimonies, one of which we dipped a cloth in oil and placed in on a sick child at the hospital and he was healed and discharged the next day from a mysterious illness doctors couldn’t diagnosed for a month: all the symptoms disappeared! We praise our Lord Jesus Christ! Amen! Thank you for mailing me earlier in the year my request for the St. Raphael oil. This truly is healing me with prayer. ALL WHO HAVE EARS HEAR! Hello…I would like 2 bottles of the St. Raphael oil sent to me. It has literally been a life saver to me. Has healed a foot issue that would have required surgery. I am so blessed. Thank you for all that you do. I greet you in the name of Jesus, Mary & Joseph. My name is Micheal O. from Nigeria. I am a member of the guild of St Anthony of Padua. I am sending you this message in respect of your powerful Saint Raphael Healing oil. I have used it and I can testify how powerful it is. I remember when i was sick and a brother named Joachim came to visit me in the hospital and gave me two bottles. I applied it and I got well! This same oil has been used on the sick with aching problems in their joints and they gave healing testimonies. I will like to get some of these oils please, to help in the good works of God. Many over here are sick due to the poor water, food and crisis happening. “For by His stripes we are healed” may the peace of our Resurrection JESUS be with you all! God bless your good works! Hope all are doing well with God’s grace. I would like to share a miraculous healing story about my father, George A. On January 8th he was admitted to the hospital due to a large mass in his throat causing difficulty swallowing and breathing. A CT scan revealed a mass was near his voicebox and they needed to take a closer look with a scope. To ensure no breathing difficulties during this procedure they also gave him a Trach, which allows for breathing but also doesn’t allow him to speak. They did a biopsy which showed- No Cancer Praise God! The mass remained and so did the pain of swallowing. After a week of waiting for a plan, a new Dr. was asked to take over. This Dr. examined the large mass just yesterday and verified the location and challenges. My sister Jean, went to visit our father and I asked her to stop by and pick up the St Raphael Healing Oil that Fr. Aniello had shared with us a few months back. Jean said the prayers along with the Oil blessing during her visit. Today I was told the new Dr. came to take a second look at my dad’s throat and to his surprise the lump was gone, no swelling at all and therefore he took out the Trach!!! Praise God again and Thank you sweet Jesus. I reminded my dad that it was the Holy Oil and the hand of God. He agreed! Thank you very much for the holy services that you’ve been providing us, the people of the third world country of the Solomon Islands. The blessed oil of the Archangel St. Raphael is helping us with our faith in church. Many miracles have happened to many people who are using the holy oil. Thank you for your holy services and may the Holy Archangel Raphael continue to pray for us. I would like to gave a couple of testimonies on how Saint Raphael Holy healing Oil has helped. LMy friend Larry’s brother Ed was diagnosed with stage-4 lung cancer in the winter of 2016. He was not given much hope, his spirits were down. January of 2017 I gave my friend Larry a bottle of Saint Raphael holy oil along with the prayer card for Ed, I also told Larry to tell Ed he was in my daily rosary. A couple of weeks later arry’s sister Joan called to tell me that Larry had told her about the holy oil for Ed, and that she had some pain in her elbow and had been seeing a doctor for a couple of months with no great results; she applied some of the holy oil on her hurt elbow and said the St. Raphael prayer on the pray card, within the next couple of days her elbow felt great, no pain at all! Joan gave Ed the bottle of holy oil and prayer card. Ed applies the holy oil daily and says the prayers. Ed still has a way to go, but his outlook & spirits are a lot better. Between the treatment and the holy oil Ed’s cancer is in remission! This blessed oil is healing me and my father. The numbness in my left foot is lessening and the horrific back pain I have had for many years now is gone! I use this everyday with prayer and anointing. Thank you and God Our Father. I wanted to take this opportunity to thank you for the healing oil. Although my father passed away on January 22, 2018,I wanted to let you know that the oil helped him in so many ways. My father Jose, had a brain tumor and had weeks to live. Before his passing he felt that he was beginning to lose his eyesight. We said the prayer and rubbed some oil on his eye. The next morning he could see again. When the pressure was too much for him to handle we would say the prayer and rub some oil on his head and in his final moments when breathing became a struggle,the oil again gave him a sense of calm and relief. I can’t thank you enough for helping my father during this difficult time. 7. Re-dedication and re-commitment to daily prayer time. I am so moved and feel that all of the above areas are so much better than they could ever have been. I listed my prayer intentions here above to show how common and simple requests … no matter how large or how small … can all use additional prayer time. I sing His praises and that of Holy St. Raphael.Thank you graciously for all of your work … it is truly performing miracles here on earth. Renee H.
I met Father Joe back in 1998. The Holy Oil cured my alcoholism back in 2003. Audrey wrote in that she had a lump on her right hand finger (due to an injury of pulling weeds 5 years prior) but now it began to grow and appeared infected. The doctor wanted to do surgery and needed to go down to the bone. I came home and continued compressions along with topical and over the counter meds. It was still inflamed and had pain. I remembered my St Raphael oil. The first night I used the oil and said the prayer, on the following morning I noticed quite a change. A pin head size on the center of the lump was oozing a white liquid. The swelling had gone down. I have continued to use the oil and now it is nearly all healed. The doctor’s office phoned me asking if I was ready to schedule the surgery and I told the assistant that I wouldn’t right now as the lump is nearly gone and the inflammation is down. She sounded surprised. It happened so quick and I m so thankful to this ministry for having the oil for all who ask for it. My father was rushed to the ER because he could not swallow or breath. Hello. My patient told me of a miracle of the healing oil on her husband, cleared him of metastasizing GI cancer. I would like to order a few vials of oil for my patients and one for myself if possible. God bless the work that you do. From Solomon Island – Peter Londeka wrote to say the Holy Oil of Archangel Raphael is helping a lot of people with differnt problems, sickness etc. Many healings have taken place when using the Holy Oil of Archangel Raphael. I am Br. Jude Chukwu OSB, a Benedictine Monk in Nigeria. I got few bottles of St Raphael oil from a brother that I gave to a friend. She told me that the oil was administered orally to a girl of 9 years who was possessed by evil spirits and she was thrown into convulsion and confession. As promised, here are three testimonies I want to share about your great work! so sorry for her and kindly passed her the bottle of oil. Try this on your husband and see if it helps she told Mr. Nori’s wife. Meanwhile, Mr Nori was so sick that he got tired and told his wife he really wanted to die as because he had been sent home by doctors from the hospital. That night, his wife signed the cross all over his body with the oil, saying the prayer for that comes with the oil while Mr Nori was fully asleep. The next morning, Mr Nori was quoted as asking his wife what she had done to him that night because that was the very first night he had fallen asleep without feeling the pains!!! that his late mother had come to him in a dream and asked him to hold her hand and then told him he should stand up and walk. After that dream, Mr. Nori had told his wife the next morning that he had woken up and tried to get up. And he did. He decided to walk – and indeed, he could walk! The wife and children were astonished! The next night, the wife again applied the oil and the next morning, the Mr. Nori who had been crying three nights before that he wanted to die, got up, had breakfast and put on his working clothes and said he was going to work!!!! When the wife returned the bottle of oil to my niece she thanked her from the bottom of her heart. But my niece had instructed her instead to thank God Almighty for his healing power, not her! Today, Mr. Nori is back to driving his car and going to work as if nothing had happened to him four weeks ago! thing which he continuously ignored up to now – praying the rosary and divine mercy chaplet. about three weeks earlier and had gone to the hospital for an x-ray of the broken hand. The picture in the x-ray was that the two bones were still far apart and the Australian specialist had asked them to return for a final check last Tuesday. In the meantime they used the St. Raphael Oil. When they went to the x-ray department and were called in to see the doctor, they were surprised to see three instead of one – two locals and the Australian consultant. When the result of the new x-ray came, they were all surprised to see that the bones had already linked and very well in tact! The three doctors were dumbfounded and pressed my grand daughter to tell them what had happened. Did someone pull the hand to make the bones reconnect? Did you use custom medicine? To both questions, my grand daughter said they just prayed for her. But the Australian doctor repeatedly said amazing,amazing!He kept pressing my granny for a straight answer. Eventually she said she had applied the St. Raphael healing oil from the church which I had given her to apply on her daughter’s broken hand. Because of that, the doctor told them that he did not need to operate as the problem had been resolved! The next day, they boarded a ship and returned to our home Province. I hope these and others from other beneficiaries continue to strengthen your faith and passion in the St. Rapahel Oil. Once again, so many many thanks! I am pastor Lawrence, from Ivory Coast, Africa, I believe God has called you and anointed you in this area of operation. I have ordered before some for myself and I was delivered from a heart arrhythmia illness that has troubled me for years, that is why i am requesting another bottle of the blessed oil for my brother. with you today and for all Eternity! Amen. will be going to Okigwe to ordained 25 Deacon and Priests. Missionary Sons of Mary Queen of Peace. Holy healing oil which he administered to me. Quickly I recovered. 2. Sister Blessing Ozoko, in Makurdi is thanking God for using the St.
Raphael Holy Healing Oil delivered me from sickness which was paining me. Many more testimonies are coming in. Winnie Walsh wrote in to tell us her husband and she use the oil daily. He has postponed his knee surgery because he is so much better. Grace Lloyd wrote to say her son is still using the oil and remains free of any MRSA breakouts. Praise the Lord. Karen from LA wrote to say her daughter Grace was told she had only a few months to live in 2013 because of tumors on her lungs and stomach.. At that time she used the oil and to this day she is still with us.! She has 3 children that she cares for. Bob from MA wrote in regarding his sister-in-law Shirley who was admitted to the hospital with a bowel obstruction. She had a strangulated hernia that would require surgery. During surgery she experienced a cardiac event, she had flat lined. She was in critical condition and they were not allowed to even touch her. When they finally could use the St Raphael oil and say the prayers over her, her condition changed. Her blood pressure started in rise and she came off the ventilator. She slowly continued to improve and is now at home living independently. Praise God and thank you St Raphael. THANK YOU SO MUCH FOR GIVING ME ST. RAPHAEL’S HEALING OIL…I PRAY TO HIM EVERYDAY FOR HEALING OF MY DIABETES WHICH HE HAS HEALED ME, FROM HIGH DIABETES OF 200 TO 300 TO A LOW OF NOW 100, 98 AND LOWER. I NOW CAN EAT SOME SWEETS SAFELY BECAUSE OF ST. RAPHAEL MERVIN & MEG LOBO. Virginia Harris would like to say that by using this oil and because of this ministry, she is going to convert to a catholic and she is 80 years old. It’s never too late! A lady who was suffering from a big ulcer on her foot that would not heal. The hospital didn’t help any. She used the oil and after three days of prayers, ulcer got healed. 2. a young woman could not maintain her pregnancy to full term several times. Every time she got pregnant, the unborn baby died before full term. One of our team members gave her the oil to rub on her tummy every day and pray. She now has a healthy baby. 3. A young lady, who was possessed by demons, talking in different voices, got very sick and was refusing to be prayed for and to receive the last Sacrament. She used to chase away people who came to pray for her. After administering the oil, she has calmed down. Our Divine Mercy group is still praying for her . 4. Another woman who had been suffering from stomachache for years, got healed after she used the oil. She is now ok. The following is one story I really want to share with you. My grandson Emmanuel was diagnosed with leukaemia which advanced very rapidly. He had a badly bleeding nose and doctors said they were astounded. The oils I requested arrived two days before this so when I heard about him, I rushed over with one bottle to give to his mum who travelled from the province to be with him. At the same time I got to the house they were living, they told me that a vehicle was rushing over to take him to the hospital. I managed however to give the bottle to his mother Alice and asked her to rub the oil on his whole body. Just at that moment, the vehicle they were waiting for arrived and took him away to the hospital. In the evening, a relative who’d travelled with them to the hospital told me his bleeding nose stopped immediately after his mother had rubbed the oil on his body! She said the doctors were quite astounded when they saw this and learned about it. Every moment after that, grandson Emmanuel only requested that the oil be applied to his body as that had helped him greatly. As a result he soon recovered from the symptoms and signs! However, two weeks after the small bottle of oil ran out, he got so sick again that he had to be admitted. On hearing this I brought another bottle and gave it to his mother. Three weeks after that, the doctors said all the signs of the illness had gone and he is now back working in his old job!!! Two weeks ago, he bought a bag of rice and gifted it to my family and when I said he didn’t need to do that, he said it was nothing but just a show of love and respect for us. I want to thank God through you all for the great work you are all doing to help poor people like us espcially in helping people like my grandson Emmanuel. Thank you so much for the bottles of the Miraculous Holy Oil I received this morning. I will give the sister (nun) who asked for it. She is in charge of this ‘home’. The sister related many pathetic stories about the young girls who have fallen into trouble or forcefully put into trouble. They are from extremely poor families in the war torn areas in our Island. This Holy oil is a great blessing for them. I too received great help from the use of this Holy oil after my sudden operation for a Brain Aneurysm, about 1 1/2 years back, My cousin who has this oil had come and applied this Holy oil on me and other times on herself and prayed for my healing. The healing was a miracle as I recovered 100 percent without any disability within 4 weeks. I was in the ICU for about 3 weeks and my neurosurgeon said I was a ‘bad’ case. It happened in the night when I was having a late night bath and rushed to hospital . I lost my memory for about 2 weeks and regained fully again. People were amazed at my healing. My husband who is retired, and financially down, expected to bring home a paralysed person. God healed me miraculously. I attend daily Mass and also has a devotion to St. Raphael and St. Michael. I still have very high pressure and it goes up very high (220-230) from time to time , if I am very tired as I have to do all the house hold work as there is no one to help me. Then, I feel I will die as my body starts to shake and I immediately reach for my help ,St. Raphael’s Holy oil. It always brings down the pressure! Carol Granfield wrote that she is 80 years old wrote about a miracle that happened with the oil nearly 18 years ago. She stated: “My nephew and his wife adopted a little girl from China. When her parents took her for her first physical the Dr. found that she had hepatitis, the serious kind. She had to be seen every 6 months at Children’s Hospital. Her numbers on her liver tests were worsening and by the time she was three, if her numbers dropped down even a little she would be put on a transplant list. It was at this point that the received the oil and prayers . They rubbed the oil on her for several years and the doctors were surprised to find that at every visit the numbers were improving. When she was about five or six the numbers for her liver were in complete normal range. The medical people were shocked as they said they had never seen this happen. A few years later she was discharged from care and she is now 18 years old, a senior in high school and is well and healthy. Her parents were in awe of her healing and we all attributed this to the healing oil of St Raphael. Daniel Harrigan wrote that he had heard about the oil from a new member of his prayer group who said the oil had healed his wife. He ordered some for his brother who had stage 3 throat cancer. He was skeptical but used the oil every day. He was a nominal Catholic at best. About a month later he called to say he was using the oil and praying the prayers. He went to the doctors and got a PET scan and was told he has no cancer. His chemo/radiation was 7 weeks but didn’t heal the cancer. He kept using the oil and 3 weeks ago had biopsies of his lymph node and his tonsil where the cancer was and there was no cancer. Gone!!! I attribute my brother’s healing to the intercession of St Raphael and our Lord. P.S. My brother is going to church regularly now! Thank you for this beautiful ministry. In June I was diagnosed with stage 4 metastatic breast cancer. This oil which I use each evening brings me peace as I put it on, say the rosary and ask St. Raphael for his intercession. Susan Swehla Des Moines, IA . Daniel Harrigan from Jacksonville, FL called to order more oil and to state that his brother had stage 3 cancer and is now in remission as a result of using the oil. He stated that it is making a difference in this world! I wanted to touch base with you with some good news. A woman at our church stopped me one day and asked about St Raphael’s Holy Oil. After our discussion she really wanted some for her nephew who was having chemo for colon cancer. This was several months ago and he recently had surgery to remove part of his intestines. His cancer was very invasive and the outlook was very grim. She stopped me again on Friday and was very excited and relieved to tell me that he is now cancer free! I did tell her to continue praying to God and the Archangel Raphael in thanksgiving. Also on New Years day I saw one of our parishioners who has been using the Holy Oil and has metastatic cancer. He never expected to have been here this past year and he is still using the Holy Oil praying for himself and for you. I could not believe it. As sick as he is he knows that the Holy Oil has helped him in many ways and he wants the same for you. The amazing thing is that many people are using the Holy Oil and their faith is helping them in many different ways. Even though they may not be cured it is helping them accept their illness and bring them closer to Our Lord. I do hope that you are continuing to do well and please know that many people in our parish are praying for you. Hello My name is Stephen O Brien.I am 47 From Dublin Ireland. I would just like to thank St.Raphael for his intercession for me to Jesus. As a child i suffered with bad Migraines but as i grew older they became worse to the stage i was unable to move or even lay down. On May 2016 a good friend of my mother’s called Kathleen. She came to the house and she brought the St.Raphael’s oil and prayer with her. So my mother asked her to pray with me with the oil.The day she prayed with me. The next day i had a bad migraine. The following Wednesday she came back again .Blessed me with the holy oil and prayed over me again. Since then I have not had a migraine at all. I still get small headaches but nothing like the migraines. Thank you Holy St.Raphael for healing me . And God bless this site for helping people to learn more about St.Raphael Archangel Amen . I have been ill for the past one and a half year. I have been using the healing oil and I believe this oil helps me a lot because after the application, I feel relieved and the pain subsides OR disappears! Carolyn Casey from NY called to say that her leg was very swollen but the doctors said they couldn’t drain it. She used the oil and then the bottom of her pants felt very wet and the swelling had gone way down. It’s my responsibility and joy to share MY TESTIMONY and EXPERIENCE regarding usage of Archangel St. Raphael Holy Healing oils in my ministry. These Blessed Sacramental’s (Holy Healing Oils) are very much helpful in my ministry specially when I go for visiting the sick. As I take the Holy Eucharist to the sick, I also give the Holy Healing Oils to the Sick and Old people. After few days, I started receiving many testimonies of healings from many sick and old people. This is spread not only to our substations but also to the nearby parishes. Now many faithful started coming (Including religious Sisters & Deacon) to receive the Archangel St. Raphael Holy Healing oil. They started EXPERIENCING THE MERCY OF GOD THROUGH HEALING BY THE INTERCESSION OF ST. RAPHAEL. MAY GOD BE PRAISED FOREVER. Once again Thank you for your generous help. In this regard you are having a share in our mission work in East Africa. Cele Cimorelli wrote to give testimony regarding her sister in law who had breast cancer surgery. She used the oil constantly between diagnosis and surgery. She had a small tumor. Reports came in yesterday, the tumor was even smaller than predicted. All cancer cells were removed with biopsy lymph nodes negative! She looked at me with a joyful smile and said, “It was the oil.” (She is continuing to use the oil. She is a deep faithed protestant and said she will be sure to share her oil if she knows of anyone who needs it. Ann Harris from NM called to say she had a fall and her back was bruised very badly. She used the oil and within 2 days it was completely normal. Addie and Lawrence Knebel from TX have both experienced healings using the oil. Lawrence had two back surgeries and when he uses the oil all pain goes away and Addie has a problem with her shoulder and when she rubs the oil on it her pain goes away as well. Cele Cimorelli called and asked for more oil. She told of the miracle her daughter experienced with the oil. She was 43 years old and had a stroke that paralyzed her whole right side. Her mom came to the hospital and put the oil on her arm and she said she could feel it. She regained feeling in her arm. The next day she put in on her right leg and one day later she was walking. Joan Lorie from NY gave testimony that St Raphael – the medicine of God, through his intercession I was able to have my retina reattached and I am able to see. Thank God and his angels and saints! Rev. Joachim Chukwudi through whom I got this oil. 2. Regina Ohazurike testified that she has been healed from spiritual attack and the arthritis since she has started using St. Raphael Holy Healing oil given to her by Rev Joachim Chukwudi. 3. Mr. Gabriel Iwu (Catechist Umuezeala Mbano) testified healing from pain he had from a motor accident. The legs pained him so deeply with much swelling. After I started applying the St. Raphael Holy Healing oil given to me by Rev. Joachim Chukwudi I got my healing. I thank God and St. Raphael for the healing. I also thank Fr. Joseph Whalen for this ministry. Thank God. We also need more of this oil. 4. Arinu Unachukwu is thanking God for the healing received through St. Raphael healing oil. 5. Francisa Esikalam is thanking God and St. Raphael for healing her from severe fever and now she can sleep well. Before then she had not been sleeping well because of an attack now God has healed her through this anointing oil given to her By Rev. Joachim Chukwudi. 6. Anyanwu Beatrice received her healing from stomach ache and chest pains. She has suffered this for three months now. After Joachim Chukwudi prayed for me and anointing me with St. Raphael Holy Healing oil and gave me one holy oil to use I got my healing within 3 days. Glory be to God in the highest. 8. Grace Njoku is thanking God for healing from sickness and pains after using this miraculous oil given to me by Joachim. 5. I had a partial stroke on the hand and legs. After using St. Raphael Healing oil I was delivered and healed from this stroke and catarrh. This oil reached me through Joachim Chukwudi and today I am healed. Praise the Lord! Alleluya. 6. My daughter Ugochi Onuoha was delivered from a motor accident after anointing myself with this miraculous St. Raphael oil. 7. Mrs. Rose Okoroafor was healed from an attack on her legs after using St. Raphael Healing oil given to me by Rev. Joachim. 8. I received healing from a bad stomach ache. All this while it seems that there is something like a stone in my stomach and sometimes it moves as if it was a snake. I got my healing and deliverance through St. Rapheal holy healing oil. Eucharia Nwodu. One woman called and was telling me her testimony. She had contemplated becoming a nun but before her final vows realized this was not the life Jesus wanted for her. So she came home and while she was praying had a knowing that she should find the St Raphael healing oil. She asked her mom about it but her mom knew nothing about such an oil. Well, she went to her mother’s cabinet and there low and behold was a bottle of St Raphael oil. Weeks later she was at a prayer meeting and they were going to pray over her for discernment for her next path in life and someone asked if anyone had any oil and no one had any until someone noticed a bottle of St Raphael oil on the coffee table! No one had brought it and no one knew anything about it. Months later her father was ill and in intense pain from kidney stones and she remembered the St Raphael oil but couldn’t find it so she decided to pray with him without oil. Before she began, there was the bottle of oil on the TV right in front of her! They had looked there and everywhere for it. When she used the oil her dad said it felt like a man’s hand was holding him down and intense heat came over his whole body. He got up and didn’t have any more pain! Greetings from Fransalian Seminary, Ndagani, Kenya. i am Fr. Stephen Savarimuthu, belonging to the Congregation of the Missionaries of St. Francis de Sales working in East Africa namely in Kenya. well, i have heard so much about your holy healing oil and one priest had given me a bottle of St.Raphael oil together with the prayer. i have used this oil for some sick people here and they have also experienced healing. After hearing that many people come and ask me for the same oil and the prayer by the grace of God, many people come closer to God. I first wrote to you in 2005, I had been totally bedridden for 15 years, when I had the anointing of St Raphael’s healing oil I immediately felt something happening in my body.It took many years but now I am back to work for 1 year. Each time the symptoms of tiredness return I have another anointing and immediately feel lifted. I’d like to say thank you so much for the holy oil you sent me last year. Here are three stories I want to share. A friend’s wife was admitted to the National Referral Hospital here due to many complications one of which was with her pregnancy. Because of the many complications, Doctors said she should be sent to Australia for treatment. When I heard this, I visited the family and gave them one bottle to use. After blessing herself with the oil for two weeks, all the complications started to clear and eventually, she fully recovered much to the surprise of her doctors. The family is in good health and the new baby was born very healthy. The second story is about a lady colleague in our office. She was complaining about kidney stones which got very painful. She found it hard to walk and so forth. Upon hearing her story, I offered her one bottle and after having applied the oil for just a week she came and said there was no more problems with the kidney stones and she got back to eating food that her doctors forbade her to eat! The third is about my cousin Paul. He was also down for kidney problems – down for one or two weeks before I heard about his plight. My wife and I visited them one weekend and went in to see him at his bedside. I asked him about his problem. He pointed to his back where his right kidney was and said that was the most painful part. I took out one bottle and poured a bit on my palm and rubbed the place he indicated. After that I told him to use the oil and tell me what happens. Just two weeks after that, he called me and said the pain was gone and he went back to eating what his doctor had forbidden him to eat! I would also like to thank you for praying for my daughter Carly Bell. She was diagnosed with bipolar disorder 3 years ago. 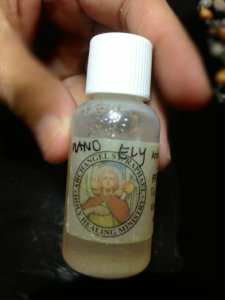 After a very serious suicide attempt in February 2016 I started praying to St. Raphael and then I received the blessed oil which I shared with her. Very soon after we were led to an osteopathic doctor who is treating her for a hormonal imbalance. Her symptoms are disappearing. The doctor has put a picture of St. Raphael in his office. It’s a miracle, I am sure!! The last time I attended the morning mass a man come over to me and my husband and told us the Lord healed him through the St Raphael oil. I encouraged him to write to you and tell his story. He said he would. I requested St Raphael’s oil as I heard how miraculous it was. You very kindly sent some to me for which I was very grateful. I have given this oil to others . One person was a young 25 year old with a mystery disease and was unable to walk or talk. Very shortly after rubbing the oil on him he began to improve and within three weeks was discharged home. A true miracle!! that bottle of oil went all around the hospital and it has helped numerous patients and given peace and hope to so many more. Many people are asking me for it. I just want to thank you so much for your generosity in sending the oil to me I will be forever grateful. Teresa McGinley Ireland. I was diagnosed with stage 4 ovarian cancer which had metastasized to my lungs in April 2013. I had 3 rounds of chemo, major surgery then 3 more rounds. I was clear for 5 months and then in April of 2014 it came back. I did chemo for almost a year and a half. Then last June 2015 I was offered to be in a clinical trial. After 3 treatments my cancer had shrunk by 75%, then in December I was in full remission. People usually do not survive ovarian cancer and I think it is truly a miracle from GOD and I thank him many times a day for giving me my life back. I have used the holy oil most of this time. At the time I got on the trial, I was needing blood transfusions regularly and the cancer was growing even on chemo. I don’t know why I was chosen but I feel very blessed and am trying to do all I can to make my life worthwhile now and help others. Thank you for the oil and your prayers. There have been many testimonies from the St. Raphael’s oil which I may not remember now but notably I will record these few. Two years ago, a young lady had Lupus, a very serious case. It was clear she would neither be pregnant nor survived the disease. In fact, the symptoms revealed clearly that death would ensue. We sought the intercession of our mother of perpetual help and St. Raphael. I gave her St. Raphael’s oil which she applied on her whole body as well as taking a bit orally for months .As she took this oil, her symptoms began to disappear. Now she has a bouncing baby boy. Thanks be to God, our mother and St.Raphael. A very serious case of diabetes was cured by the St. Raphael’s oil. Many cases are still being cured by its use. Praise the lord. A patient had a serious stroke and bladder ailment which was declared incurable. We prayed and used the oil and asked the wife to continue the prayer to St. Raphael as well as use the oil. Not long after she gave her testimony of the husband’s cure. We thank God. Maureen O.
I thank you all once again for sending the oils there are so many testimonies many of my priest friends are giving me testimonials. Here is one from a friend of mine in Africa. Claire, she is a lay preacher in Malawi, she distributed oils to her prayer group and here is a testimony from a woman in her group, many were so surprised,I had eye problems it was like a foreign object was in my eyes for quite a number of years for almost 20 years, after using the St Raphael oil I was very surprised that the problem had gone instantly. Hello, I have received many healings over the years using the holy oil. The latest is my thumb on my right hand was healed of carpal tunnel.Beth D.
That oil healed a really bad chest cold in hours! Belinda O.
Donna from CT said her daughter was in an abusive relationship for 15 years but didn’t have the strength to leave the situation. Donna used the oil in proxy for her daughter and within 4 days her daughter came to tell her she was leaving the situation. A friend of mine has been fighting cancer for years. She originally had breast cancer, but about a year ago she started developing several other tumors. She had surgery and chemo, but she wasn’t getting the best results. She has been using the holy oil during this past year. A few weeks ago she was in bed and had forgotten to put her eye drops in her eyes. She accidentally picked up the St Raphael oil and went to pour it in her eye. Of course she now had oil everywhere. She didn’t want to wipe it off with a tissue as she couldn’t throw it away with the holy oil on it. She then rubbed the oil all over herself wherever she had tumors. A few days later she went for a pet scan. All of the tumors had shrunk! Amazing. Praise the Lord! Oma H.
I truly believe in the healing power of the oil and Our Lord Jesus Christ and Our Blessed Mother. I had suffered with a splitting headache for three days and nothing I took helped. My ex wife had the healing oil and said for me to use it and rub it on my forehead which I did and within a minute my headache was gone. I truly believed that the oil and Our Lord would help me and I was amazed when it did. Felipe D.
Prior to me leaving on a trip to Las Vegas in June of 2015 , I made a flower planter so I can take flowers to my wife’s grave. When I returned at the end of June from the Las Vegas trip, I went to Los Olivos Ca. near my home, they have a really nice nursery there with very unique garden things, Berry and I would go there quite often. Well I saw this beautiful butterfly, it really caught my eye so I bought it, on the way home, I was thinking of where I could put it, then it dawned on me I could put it on the flower planter that I made for Berry! So when I got home I put it on the flower planter to make it look like it just landed there. I have been going to Church in Solvang Ca. and really like the Priest there. He talks a lot about spiritual happenings, while in church I opened my Prayer card and saw a colored Butterfly print on the center of my Prayer Card! The first thing I thought of was the Butterfly I bought for my wife on the planter, so when I got home, something told me to put it up to the light and that is when I saw that there were other Butterfly’s forming, my wife always knew I always used my prayer card, this was a Beautiful Blessed day! The Butterfly’s are still there to this day! I always knew that there was a God and that there is spiritual life after death and my wife Berry is my guardian Angel. Eddie G.
I gave a bottle of oil to an older Vietnam veteran (who attends daily mass) because his wife told me he has Crohn’s disease. This morning he came over and told me that he thinks the Lord is re-filling his bottle. He uses the oil everyday and it still isn’t empty. I gave him the bottle of oil a year ago, summer 2014. I will remember your organization. I think your ministry is powerful. A friend experienced conversion. I have a deepened faith and extra connection with archangels. Whatever it was your ministry is powerful Seth H.
Thank you so much for the Raphael oil… I have been going to a woman for acupuncture, prior to every treatment she prays at my feet with the oil… I had cancer and am now going through treatment…. I am so glad for you to do this for us… much blessings ..
Regina S. had several testimonies to report. She gave the oil to a friend in Florida whose brother had prostate cancer. After he used the oil and prayed he was informed by his physician that he had no cancerous tumors. Regina’s friend also sent the Holy oil to her friend in Ireland whose husband had cancerous lesions. He used the oil and was told by his doctor that he no longer had cancer. Regina was moving furniture in her home and a hard bedpost landed on her toe. The pain was excruciating and her toe became black immediately. She could not even walk in the foot. She prayed the St Raphael Prayers and used the oil on her toe. The pain left immediately and the color of the toe returned to normal immediately. Regina’s sister banged her knee and felt she dislocated her knee. She immediately used the oil on her knee and prayed. The pain disappeared and the knee pain disappeared and the knee returned to normal. I believe my husband who had cancer was able to be treated successfully because of the St Raphael oi. Rosalie B.
I would like you to know my friend Silmy got better after you sent the oil to Hong Kong. My granddaughter was having nightmares that had monsters in them. Georgeanna is 4 years old and hated bedtime because she was scared the dreams would start. She would wake up at night and cry and her dad would have to sleep in the floor sometimes till she went back to sleep. I gave my daughter in law Lora a bottle of St Raphael Holy Oil and told her to bless Georgeanna before she went to bed. She woke up the next morning and said “Mommy, I want that oil and blessing every night. I didn’t have any bad dreams”. Kathy W.
I’d like to order some St. Raphael healing oil for my mom. I just started using it a few days ago and it is already proving to be wonderful. My back is healed and my physical strength has returned. Thank you. I hope that my healing continues all the way until completion. Jersie M.
Renate M. – wrote to tell us of a dry eye issue she was having and was having trouble taking the medicine. The doctor wanted to scrape the Cornea and put a contact lens over it so it could heal but it was right before Christmas so the doctor asked her if she could wait until Jan 4th. She used the oil for the two weeks and when she went back the problem was gone. The doctor didn’t know what to make of it and asked her if she had been praying. When she told him yes, his response was, keep doing it. Glory, all praise and honor be to God, with thanksgiving and love for the successful results of skin cancer surgery yesterday January 12/2016. I just received the vial of St. Raphael Healing oil last Thursday (January 7/2016) I began that evening (and over the course of the next five nights up to yesterday, the morning of surgery) … In faithful trust and abandonment to God’s will, I recited the prayers and applied the oil to the affected area under my left eye. The surgery was scheduled to take a minimum of four hours , with the possibility of it taking even 6-8 hours due to the location of the cancer and depending on the amount of cancerous cells they needed to extract using the MOHs method. Once the cancerous nub and surrounding cells were extracted, upon further testing, I was given a positive prognosis and was sutured and released all within two and a half hours! Even the nurses congratulated me on such a positive and rapid result… With special thanks for the love and intercession of Our Lady of Czestochowa, St. Raphael, St Peregrine, St. Faustina, as well as the many angels and saints in heaven as well as those here on earth who offered Masses and prayers for me. If you place yourself In His Hands trustingly, He will never forsake you! May God Bless all of you for your good works! Sister Teresa L. – wrote that she is using it in the nursing home in MI. She uses it for all her residents at the facility. “God has truly blessed them through it. One lady who was dying regained her health”. Michelle, a former colleague who is in her 40s, was told both sides of her thyroid would need removal; there was a 40% chance of malignancy; and medication would need to be taken the rest of her life. She was, in her words, “A basket case—I can’t eat, sleep, or stop crying. My kids are going to be without a mother.” I gave her a bottle of St. Raphael’s Healing Oil. She underwent surgery. There was no trace of cancer anywhere in her body; only one side of her thyroid needed removal; and no meds are needed. She was back to her old routine within two weeks of the surgery. John, a man in his 60s who is a customer at my place of employment, told me he had stage 3 prostate cancer that might have spread to his lymph nodes and added that he had been depressed since January. I gave him a bottle of St. Raphael’s Healing Oil a week prior to his surgery. The week after his surgery, John came in to specifically tell me, “I know it was the healing oil you gave me. The cancer was localized and the doctors were able to remove it all. There were no complications and I don’t need to undergo any further treatment. The hospital, doctor, staff, and meals were all terrific. It sounds crazy, but I actually had a great time there and I’m not depressed anymore.” He was back to his old routine one week after surgery. My dad, who uses St. Raphael’s Healing Oil on a daily basis, slipped on our staircase and somersaulted down 10 stairs. He only sustained a hairline fracture to one finger and one rib. His recovery was quick and relatively pain free—even with the massive contusion to his side. Our family is thankful for the Divine Intervention he received and we attribute it to the fact he is a daily communicant who uses this oil daily. Thank you, dear Lord, for allowing St. Raphael to intercede for my family before Your Throne. A parishioner, who my family is friendly with, told me she had been diagnosed with breast cancer and her doctor indicated that it was probably malignant. One week prior to her biopsy, I gave her a bottle of St. Raphael’s Healing Oil. Her biopsy came back “benign.” Although her doctor still wanted her to have IV chemo once a month for a period of six months, she never lost her hair or became ill. The only side effect was, on the day of treatment, she was tired the remainder of the day. Two years later, at age 72, she remains cancer free. John, who is in his 70s and has Parkinson’s, was told the skin cancer on his forehead was most likely malignant. With the medication he was on, cancer treatment was not an option. I gave him a bottle of St. Raphael’s Healing Oil two weeks prior to his surgery to remove the growth. The biopsy came back “benign.” All that was required was removal of the lesion. No follow up required and it has not reoccurred. Thank you so much for the Holy oil you sent before. I myself use it and gave others who were helped by it. It is a truly miraculous oil. As it’s very powerful, so many are asking for it. I myself use it everyday as I have high blood pressure that is difficult to bring down ,but I am healed from the surgery in the brain by this oil. I live in Gweru, Zimbabwe in the Southern Africa Continent. I am kindly asking you to send me the St Raphael Holy Oil for my use. I have Lymph Nodes which are not going away. I was told by one of my Catholic Friends to use the Oil with prayer and she did herself and she was healed. Elva S. called requesting more oil. She said that whenever she puts it on a part of her body that hurts, the pain goes away. She puts it on her knees when she needs it and recently she put it on a toe that she stubbed and was hurting tremendously. The pain went away. Ave Maria! Ave Maria! Ave Maria! I am very happy to write to you in this month of October 2015, month of Mary and month of Grace. May the peace and love of Jesus Christ and His Blessed Mother Mary be with you today and for all eternity! Amen. 1: Mrs. Rosary O. was healed through the St. Raphael oil. She is with tears of joy thanking God and the St. Raphael oil from death by poison. She could not pass feces for some days and was very uncomfortable and restless. Immediately after anointing herself and drinking some of the St. Raphael oil all poisons were washed away instantly. She vomited out all the toxic materials and regained her health. She thanks God through St. Raphael for delivering her from the poison and the spirit of death. She also gave the oil to her daughter who was under spiritual attack at school. Her daughter testified, upon the anointing of the oil, the occultic spirit stopped attacking her in her sleep. 2: Dikachi O. was trapped under his car when it caught on fire. The car was totally burned and he suffered terrible burns all over his body. I gave him the oil to use on his severe burns and now the burns have healed rapidly and he can now work! 3: From Mrs. E from Umuodinmma: A.O.I. testified what God has done for her through this oil. She had a lump on her right breast and after she started using the oil the lump disappeared within a few days. She was cured from this lump that afflicted her after blessing herself with the oil. 4: I, Uwagbaokwu C. am thanking God for saving me from the spirit of death and severe sickness while using this healing oil. God healed me through the St. Raphael oil of chest pains, emotional sichness and also from appendicitis inflammation. Everytime I use this oil there is a miracle in my life. I cannot sleep unless I sign myself with this healing oil because of its efficacious power of healing and also delivering and protection of evil. Thank you, Jesus, for healing me through this St. Raphael oil. I promise to give out this oil and preach about it to the sick and afflicted. Dr. K.C.O. and Dr. A.U. from the Dept. of Surgery Federal Medical Center and Amarajane Hospital use on their patients for healing. The St. Raphael oil has done many miracles for me and my entire family. My father Chief R.O.U. was saved from the spirit of death through this miraculous oil. I thank God and St. Raphael for all the healing and grace. I also gave the St. Raphael oil to a newly ordained priest, Fr. H.C.O. and he asked me to send his appreciation to all of you for all the healings through this oil. He is using this oil to pray for the sick, in the hospitals and deliverance work. Many testimonies have been recorded, I will send them to you gradually. Thank you for the oil. We use in the missionary work of healing the sick and afflicted.We thank you very much for your kind generosity. The orphans, abandoned children, youth and the sick and suffering of God asked me to send their greetings to you too. Please send me another bottle of healing oil. It has helped my foot healing immensely and I am so blessed by St Raphael. Thank you for sending me this miracle. I am writing to request (2) small bottles of the sacramental healing oils. I have personally been given this before, used it “religiously” and recited the prayers with it. It truly healed my elbow injury. It was miraculous!!! Renee H.
Just wanted to tell you that my husband, and I have been using the blessed oil on our physical ailments, and we are both so much better. His eyesight, after a laser procedure about 2 mo. ago, has gone from 20/50 to 20/40 to 20/25 (using the oil), and he also applies the oil to his stomach area to heal the “leaky gut.” That seems to be improving as well. I apply it to my arthritic joints and so far no flare ups! I also apply it to myself in proxy for my grandson’s anxiety. He is better! J.C.
A young 4 yr old child has Kawasaki Disease and has had a fever for over 4 weeks…no appetite…no energy…losing her hair…so I sent her parents the oil and they anointed her while saying the prayers…within an hour or so she was up and around and ate all day….they are so grateful and in awe to our good God. Another young 35 yr old man with 3 young children was diagnosed with lung cancer which then metastasized to the brain…he was given only a yr to live…well we sent the oil and he is 3 yrs into disease with no side effects or sign of cancer at this time. My daughter recently gave me a small bottle of the holy oil, and my husband and I have been applying it to our many physical ailments. His eyesight has been improving dramatically, and my arthritis in practically every joint has also improved. Well it starts off with my son Leon, he was admitted into childrens hospital his second day of life due to low temperature and two cardiac arrests. He also had abnormal blood test results. When he got transferred to children’s hospital he had another heart attack. When the doctors found out what was wrong with him they told us he had a low chance of surviving because his body was filled with a high ammonia level no adult or child has ever survived from. He was diagnosed with HHH disorder but we later found out he has OTC disorder which is a disorder where he can’t process protein and turns it into a toxin called ammonia. I prayed every day to God and mother Mary to spare his life. And they answered my prayers, i came upon your website desperate for help and ordered the oil. I saw the testimonials and i believed them. And i believed that the oil would heal my son. When i received the oil I prayed and shortly after my son got better and we were able to take him home. Day and night I was in the hospital with my son for 4 months, I was just so happy to be able to take him home. The doctors were so shocked that he even survived and I’m so thankful for what you are doing. May God bless you all! Rochelle Q. My mother was dying when she was 86. Three Dr’s said there was no hope. I blessed my mother with the oil and now she is 96! Also my nephew was born with a genetic disease that by the age of 5 he would be an old man. They tested him 4 times and it was positive each time. His parents prayed and used the oil and on the 5th test he no longer had the disease! Praise God! I just wanted to take the opportunity to ask God to bless you and your ministry, and thank Jesus for the work you are doing. The reason for this email is threefold. You recently received an email from my brother Andrew, and sent him a bottle all the way out here to Australia. He does have health issues, some I understand, some I don’t. The second point was to let you know the effects of Jesus’ healing through the oil, and the outcome of your many prayers. My brother Andrew and I share a spiritual path. We are twins both on a journey we are hoping back to God from this Exile. The oil has afforded quite some comfort to Andrew, making it possible for him to live without so much pain, particularly bodily pain, which was stopping him from doing much with me and doing what needs to be done. Being who I am, I used the healing oil and prayers on myself as well, wondering what it was all about and asking to be proxy for my brother. The spiritual healing afforded to myself and my brother has been surprising, overwhelming, and I wanted to make a testimony to the truth and realness of your mission. This may sound different from the usual testimony you receive. However with praying the prescribed prayers, using the oil and devotion to Jesus wholeheartedly, not only has your mission assisted my brother in bodily healing, but it has helped us both grown stronger in the His Spirit, to live once more an ‘ascetic’ life, not so concerned with things that distract from God, and helped us to be centered fully on seeking Heavenly treasure, that is in finding Jesus, in being worthy to be received by Him on that day. It is somewhat of a revival for us both, as we have both lived the life He has called us to, yet as we all do, coming and going, rising and falling. To be to the point, the spiritual healing we both have received is quite incredible. It has allowed us to recognize and once again give ourselves completely to what we see as our mission here on earth, that is to live together and to simply pray for others, pray for the world, in a kind of hermitical life. All in Jesus, of course, but thank you all for your work, and especially prayers. Somehow I think you are making the entire Heavenly community smile. Many thanks and in Jesus name love to you all, may Mary our mother the Mother of God watch over you, and of course may St. Raphael continue to be in your Holy Mission. Peter V.
In the past, God has answered numerous intentions through the intercession of St. Raphael. A fellow choir member’s granddaughter had successful treatment of advanced leukemia; I’ve experienced healing of anxiety; and others have spoke of great miracles. God bless you in abundance. Andy V.
Mrs. E N is testifying of the healing received while using the healing. She had constant fever and arterial pains. Immediately she use the healing oil, the fever and pain left her. There is a woman who was having difficulty breathing. After using the oil she was miraculously well. There is a woman who was suffering from fibroids, after the surgical operation, the wound refused to heal for 3yrs now but after praying for her with Arch Angel St. Raphael holy healing oil the wound healed within one to two weeks, not only that woman is pregnant now. She came thanking God and St. Raphael. A woman in her 50’s suffered from sores on her breast. She received treatment from the hospital as well as from private doctors but none of the medicine helped her. Last year a promoter of the St Raphael oil anointed her with the holy oil twice and she was miraculously cured. She is now attending Mass and other church activities. A young man was bitten by a centipede and was rushed to the hospital. Upon his arrival suffering from severe pain, he was anointed with the St Raphael oil and the pain was gone immediately. Maria wrote about her daughter who was very sick. After 4 spinal taps, numerous CT scans of the brain, blood tests, dialysis and plasma exchange therapy, life support machine and medically induced comma for 3 weeks, her daughter is alive and well. The mom remembers the day she received the oil. She brought it immediately to her daughter at the hospital and her daughter used it right away and continued to use the oil even after she was discharged. When she returned to the hospital with her daughter the hospital staff said “It is a miracle, you defied science”. Today, her Neurologist stated that he will probably never know her diagnosis and he himself says it is an act of God. God is so good and merciful. My husband was cured of COPD and heart issues using the oil. He was on hospice last year and he got better. They were told no one gets better in the condition that he was in. They attribute it to the St Raphael oil. Nuala from England told about her finger that was crushed a couple of years ago and she used the oil When she went back to the doctor 2 weeks later he said “I don’t know who you have been praying to but keep it up, this is a miracle” her finger was healed. Sister left her handbag on a train in London. She prayed to St Raphael for assistance. Her bag was recovered with all of it’s content including cash, credit card and phone. Praise the power of God and his angels. A neighbor had requested some of the St Raphael oil when she found lumps on her breasts. After using the oil the lumps miraculously disappeared by the time she had her appointment with a surgeon to have them removed just a couple of weeks after receiving and using the oil. A man from the Solomon Islands wrote about how ill he was due to a particular poisonous plant that grows in the forest. He was scratched by it and became bed ridden and very swollen. Someone brought him a small bottle of St Raphael oil with the prayers and he applied it over his body and suddenly all the pains disappeared within a very short time. Connie told the story of a woman she had given the oil to. The woman was taking a strong antibiotic and felt it was hurting her ligaments in her calves. The next visit her eyes were bright and she said that her calves were better, however she also used the St Raphael oil on her knees and they were healed. The person was healed of warts all over his body after a friend prayed with him and used the St Raphael oil. Cheryl let us know of her daughter who had leukemia and was 98% filled with cancer. She used the oil and continued with her chemo. When the oil was applied the girl oozed oil throughout her body. This happened 3 times. Her numbers went to 0 and have stayed there for several years. Joan wrote to tell us that her husband had been healed and she attributes it to using the St Raphael healing oil. She stated he had 4th stage lung cancer diagnosed a year before and was on chemo. He had little tumors lining the inside of his lung plus the original tumor which shrunk 2cm. The cat scans that he had in the hospital only 5 weeks before showed all the tumors and a pet scan that he had a week before showed only the one tumor 3cm left and it will be taken care of through radiation. Praise God, she believes they had a miracle through the intercession of St Raphael. Shannon from Texas explained his wife was pregnant with their fifth child and was told she had a complete placenta previa and was facing either a premature baby or a miscarriage. She went on bed rest and used the St Raphael oil on her abdomen. Two weeks later a specialist told them it had completely cleared. He was introduced to the oil of St Raphael and he used it daily. The last visit to the specialist Fran wanted to give this praise report from her friend that used the St Raphael oil on her son. In June of 2014 her son was taken to the hospital where his heart flat-lined (stopped completely) and he had paralysis in both arms and extreme pain at the base of his neck. A trans version of plasma was advised as they suspected anti body in the plasma was expectethe diagnosis for a cure had not changed since they still didn’t know the cause but her son can now walk and use his right arm which totally surprised all doctors… The doctor explained that he cannot believe that this happened. They both believe it was due to his faith and the St Raphael oil. Cathy wrote to speak of her problem with halitosis. It was very unpleasant. She had consulted a dentist several times and they even did an endoscopy test. She was desperate. When she read about the healing oil, she wanted to try it. After using it for a short time she consulted with a colleague and they confirmed her halitosis had disappeared. Jane from IL had a praise report that her son who was addicted to drugs for 10 plus years is now sober through the intercession of St Raphael and our Blessed Mother. She is so grateful to have her son back and praises Jesus. JoAnne from Quincy spoke of her patient in a nursing home who was blind and missed being home. She gave her the oil and within a month the patient had eye surgery and started to see again thanks to he devotion and through the intercession of St Raphael and our Lord. Robert from New York has been cured of lung cancer and he attributes it to using the St Raphael oil. Only a very small tumor remained. Brittani from NY was healed from a life long thyroid condition that she had for most of her adult life. She suffered from hypothyroidism. She used the oil faithfully every night and decided on her own to stop the medication. When she went back to her physician, he took more blood work. Her thyroid was normal and healed. The doctor couldn’t explain why she was healed. Brittani knew the answer. She knew that through the intercession of St Raphael and the Blessed Mother, she was healed. Mary-Jo from Florida wrote to tell us of the wonderful miracle that had taken place in her family. Her uncle Joe who was 82 became very ill with E Coli. As tests were being done, it was found that he had 8 tumors around his prostrate. The following day he was free from his symptoms. A week after that prayer group he had an ultrasoun fever that it damaged a stent in his heart. The infection cleared but the doctors were reluctant to biopsy the tumors due to complications with meds. Her uncle’s health continued to decline but he held onto his faith and believed God had already healed him. They found absolutely nothing wrong. The doctor was amazed and asked for prayers for himself. To God Be the Glory.